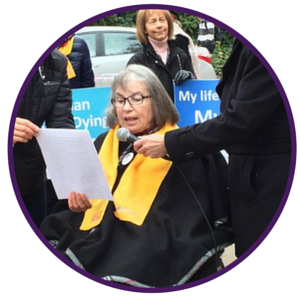 We wish to share with our friends and supporters a few words about a tireless advocate, and our friend, Elayne Shapray. Volunteer, activist, spokesperson, and indomitable spirit. Born on Sept. 30, 1946, in Montreal; Elayne died on May 2, 2016, in Vancouver, of a consensual physician-assisted death, age 69. This tribute to Elayne was written by her husband Howard Shapray. In 1968, when I met the woman who would become my wife until her death did us part, Elayne Auerbach was a nurse working with disturbed children in a child psychiatry ward. Early on she told me that that was not her career of choice. She had wanted to become a doctor working in the jungle villages of Africa alongside Albert Schweitzer, aiding sick and dying people who knew no hope. How ironic that she would, at the end of her life, fulfill her goal while sitting in a wheelchair in Vancouver, fighting for the constitutional rights of future generations of suffering, incurably ill people. When she was not being a wife and guiding light of two children and four grandchildren who she cherished above all else, Elayne gave her life to volunteerism. She was a doer. Although she sat on the boards of numerous community institutions, she was always happiest when she got her hands dirty working in the trenches with society’s outcasts and underprivileged; clothing the poor and helpless through a coat drive she ran for 20 years, educating disadvantaged children with a mobile preschool she helped to establish, adopting a Russian refugee family, creating a welcoming drop-in centre for lonely seniors, counselling distraught people at a family planning clinic or crisis centre, or tending to the dying in Vancouver General Hospital’s palliative care unit. Volunteer work energized Elayne and fuelled her existence. During her 15 years as a volunteer in the palliative care unit, she saw how cruel and wrenching death could be in spite of morphine drips and other forms of palliative sedation. 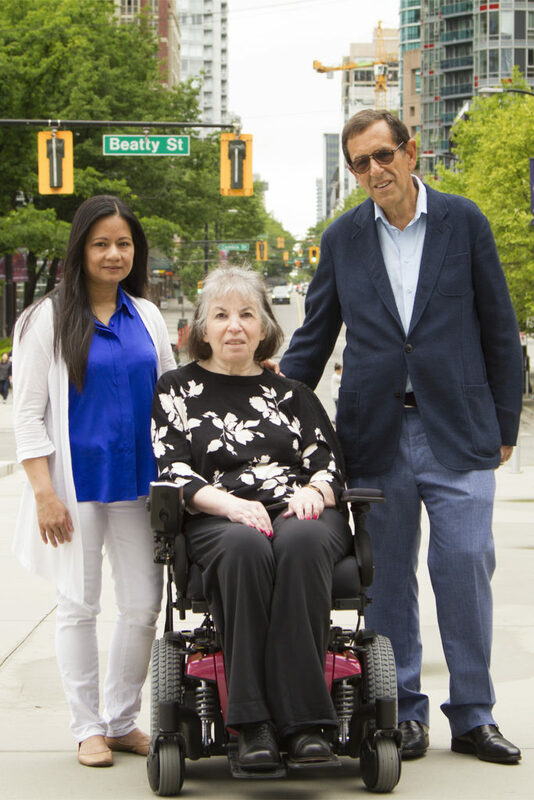 For almost 20 years, Elayne hid the fact that she was afflicted with a form of progressive multiple sclerosis from her many friends, allowing them to speculate as her ability to walk began to disappear. Her smile and her often sardonic sense of humour was the mask she adopted, until her last breath, to protect her friends and family from the truth of her suffering. Elayne died at the time and place of her choosing in the presence of a caring physician. Hers was by any reasonable definition a “good death” – smiling, joking, surrounded by best friends and family as she peacefully slipped away into her final slumber, instructing me to, and hoping others would, continue her fight for fundamental justice. Howard Shapray is Elayne’s husband. Next Post: We’re hiring for a Staff Counsel (Policy)!